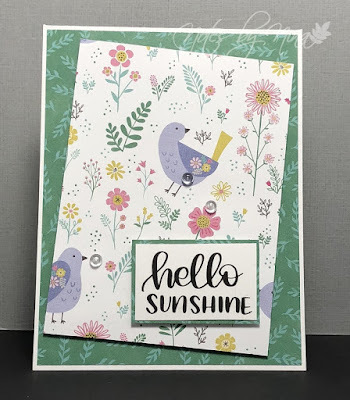 This cute as cute paper reminds me of spring, I love that the birds are up and about chirping first thing and don't forget we have the switcheroo with the clocks this weekend. I used simple layers for my card, the top panel and the sentiment are both popped up with some foam tape. I finished with some dew drops. Supplies: White cardstock, Designer Paper - Pink Paislee, SSS-Easter Greetings, dew drops.